The Sun: falling into an even deeper funk | Watts Up With That? With Climategate sucking all the oxygen out of the blogosphere, we’ve neglected some of our regular reporting duties here at WUWT. much improved. They are a few days old, though. 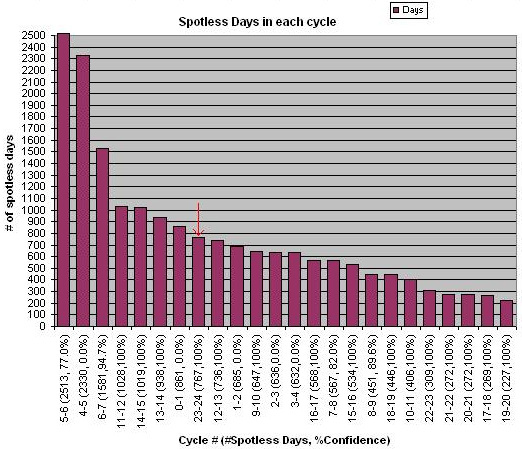 The 2009 spotless days are now 262 and the cycle 24 spotless days are now 774. On the cycle graph, I now calculated three different sets of spotless days per cycle. Minimum just counted the actual observed and reported days of zero sunspots. 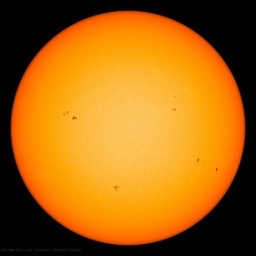 Maximum assumed that all missing obs were zero sunspot days. Likely assigned spotless days to the missing obs in the same ratio as the reported obs for that year. The graphs were reporting what I now call Minimum. They now report Likely, hence the increase in values for some of the older cycles. There is a second number now too, a % confidence. I calculated this by the following formula: 100% * (1 -((Maximum – Minimum) / Likely)). When all obs are reported, Maximum = Minimum = Likely so this becomes 100%. Any cycle where the confidence is 0% means I gave it my level best estimate, but anybody else’s estimate is more than likely just as good. To put these into context, I looked at the 13 month smoothed peaks of all the numbered cycles. 80, as well as 90, would be the weakest cycle since 1933.
since 1823. 49 would be the weakest cycle since 1810. 48 or less, which includes Dr. Archibald’s prediction of 42 (and my May 2009 update) would be the weakest cycle since the Maunder Minimum. So, it seems the only solar cycle which rose even slower than this one was cycle 6. December 2, 2009 in Science, Solar. Following on the link I put in the tips section, with the sun being so quiet, we have one of the conditions to get into an ice age. If we start getting some major volcanic activity the second condition will be met and regardless of the claims made by the new AGW religion, we will rapidly fall into an ice age. Interesting that the peak estimate for cycle 24 keeps declining. It will be interesting what happens if 2010 is very warm despite the deep solar minimum. What would that say about the influence of GHG-induced warming relative to the influence of a solar cycle? Very interesting! Thanks Paul. Meanwhile, why is spaceweather.com’s sunspotless days (252) a lot different from SIDC (262)? Is the former trying to “minimize” the contributory factor of the current solar minimum in the Earth’s climate? is there a lag in the temperature effects? it seems i have heard that claim made on here and it makes sense but is there any way to back this claim up? if it is a lag of 3 to 5 years then we would just now begin to see some fairly significant cooling in the next 12 months right? WUWT talking about the Sun again – that can only mean a sunspot or two on the way. Where did humanity get it wrong? Was it in Montreal, or in Kyoto? Go back to climitegate because stereo.gsfc.nasa.gov suggests it is too early to get too excicted. Well, the “Ring of fire” is definitely stretching its legs the last 15 years, and I see no reason to think we’ve seen a peak yet. . . so some more very significant volcanic eruptions in the next several years seems quite possible to me. . .maybe even crossing over into “probable”. I figured this was coming. I pulled some strings to get moved to South Carolina. It may not be far enough south. Those liberals are having a string of bad luck, the world cools just enough that a semi-conservative congress couldn’t quite accept Kyoto. They get enough libs elected plus a lib president and they have all the elements in place to use global warming to take over the economy, then a conscientious climate scientist gets cold feet and rats out his climate marxist buddies. Now it may get really cold and ruin the libs anti-petroleum / anti-coal agenda. A real darn shame when fantasy gets mugged by reality. Couldn’t happen to a better bunch of corrupt elitists. JohnV (16:11:14) : “It will be interesting what happens if 2010 is very warm despite the deep solar minimum.” John V, I can only assume you mean warm as measured by satellite as E. M. Smith has put paid ti GISTemp for long term compariosons and CRUTem…………………. HarryG – you mean Anthony has his own Gore Effect? Do we call random sunspots appearing after WUWT postings WattsSpots? I’ve searched, but I cannot find. Is there anywhere that has data on recent sunspot activity that would have been detected using the techniques of 50/100/150/… years ago? I was wondering if AW, MM, or a guest blogger had or would respond to that chain of science/logic, either in whole or step-by-step. Well, we sure would have additional information in that case. Unlike the warmies, when the facts change, skeptics change their opinions, what will you do? The November run of spots, while up numerically in count, was down in area. Neither was the contrast anything to write home about. As I have spoken to Leif about, he was very correct to point out that many would jump up and down when we have a big spot, which will occur even in a Maunder-type minimum. Over the course of the last year, Solar Activity has positively increased, but that increase is not what one would expect in a standard cycle. Therefore, I do not expect it to do anything more than the current rate of increase within 1 sigma for the next year. That does leave open the possibiity that it will decrease by that amount. L&P effect may be on a trend, but that doens’t mean it’s riveted to it. Ditto for a hot year the warmists long for. That would be a true outlier given the present conditions, which have cooled the last 10+ years. We may eventually get to the drivers and mechanisms of our climate, but for now, we have only the literature to tell us that continued Deep Solar Minimum will mean continuing decline in global temps, with the associated noise. Safe to say the Sun will NOT presently co-operate with AGW. The coverage will eventually expand to 01/01/2007 to present. If it wasn’t for the catastrophic anthropogenic global warming narrative, this would be front page news. We have a historical correlation between temperature and sunspots, and we may be entering an extended period of weak solar activity. If Earth enters a significant period of cooling and we are unprepared for it, the Global Warming cheerleaders should be held culpable for the results, i.e. crop failures, starvation, cold related deaths, etc. Phil, why don’t you find the paper that explains how the cloud feedbacks are accounted for? It seems like that controversial point is dismissed without even so much as some hand waving. Now all we need are true/proper/raw/unfudged temperature data sets (*cough* not CRU *cough*), and perhaps we may have some correlation going on with low solar activity this past decade alongside GMT levelling and/or dropping in the same length of time…..
Afterall, the new science truism now appears to be : “Correlation proves causation”, right ? …. Then we should gather together a ‘consensus’, a few appeals to authority, and a nobel prize worthy glam-movie, and we’ve got ourselves a viable fact-theory folks ! …. solar tax anyone ? No, there is no present study per se, but you can compare Sunspot Area Measurement from Debrecen(2007/8) and SONNE(2009) to Greenwich.(1874-1974). At least with the sun we get to see some of the data and solar scientists getting it on … no consensus here. This is the price we all pay for the Warmists driving Science the wrong way on the Freeway. Do we ever need untainted historical temps !!! And we are going to need them soon. A possible third condition – thermonuclear world war. I was wondering, if carbon dioxide does not create a “greenhouse” effect and warm the Earth somewhat, what is the factor that allows a cloudy night to remain much warmer than a clear night? I have been logging temps in Omaha Nebraska. On a clear day and night the temp can vary between 20-30 F. Cloudy days or nights has a much smaller difference. What are the clouds doing that makes the night stay considerably warmer than a cloudless night? Do they reflect infrared back to Earth and rewarm the ground? Do they stop convection cells from depositing warmed air to cooler regions above? If clouds can prevent or slow heat from leaving the air below, couldn’t carbon dioxide also cause this effect to some degree? Does anyone have a good explanation of why clouds keep the night realatively warm? There has been no warming since about 1998. 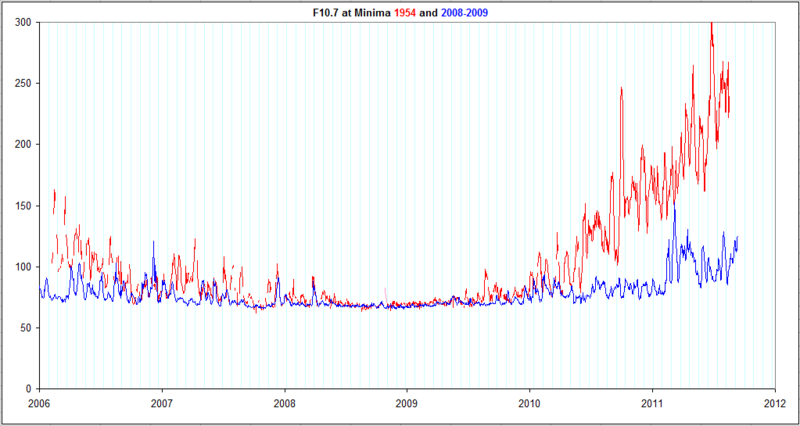 And yet the sun went through a very active cycle, with a peak around 2000 and with outbreaks of large spots into 2003. I remember hearing that the sun was more active than in the last 1000 years. Seems odd. Landscheidt (landscheidt.auditblogs.com), et al., predict that we are entering a grand solar minimum that will rival the Dalton, if not the Maunder. Others agree we shouldn’t see warming and ought to see cooling for the next 20 years. Solar wind, solar flux irradiance all are down. NOAA is advocating a moderate ENSO through May, although it’s just as likely to be weak and resolve itself sooner. So, if I don’t see a global temperature decline reflected in official records by 2012, I’m bringing my own qui tam action for fraud. I think this chart is likely of very great importance. note it runs right to left. I did look at Lief’s links and there is no decline in several neutron monitors. is showing a new peak. Lief will claim this one site is not significant for showing a new peak, but there certainly is no decline in the cosmic rays. Who goes to RC anymore? They’ll tell you the graph goes up when it goes down and then they’ll just spin you around. Norman, you are probably right. Remember that clouds cover >50% of the surface and absorb/”reflect” all IR coming from the earth, not like thin veil of GHG which absorb here and there and have big IR window where they do not absorb at all. Clouds aka water simply rulezz. You should probably copyright this Mr. Stanko ‘cos Hathaway and his buds will need another revision come the New Year if things don’t kick off. a double eleven year cycle, ie the hale cycle or 22 year cycle, shows a strong correlation between solar activity and temperature as opposed to the 11 year cycle. “Corbyn identifies bursts of solar particle and electromagnetic activity he calls SWIPS. These can be predicted deterministically, he claims, although he won’t disclose his method. The key is not the 11 year cycle, or even fluctuations in total solar irradiance (TSI), but the 22 year Hale Cycle in magnetic sunspot activity, which indicates changes in activity in solar wind. Dave the Engineer: You really should stick to engineering, as politics is obviously not your field. Last night Obama gave a warmongering speech that should make even the most arch conservatives swell with pride. Or did you miss it? The liberal blogosphere thinks Obama is George Bush II. So much for HOPE and CHANGE. The general trend is the longer the solar cycle, then the colder the global temperatures. If this relationship is true, then the sunspot theory would predict a very cold situation for our upcoming years. I do know that 2008 was the largest single Jan to Jan drop in global temperatures in 125 years. Does anyone know what the global temperature situation is for 2009? I don’t understand this too well, but it appears there is a recent increase in neutrons(cosmic rays), watts up with that? do yourself a big favor and get The Little Ice Age by Fagan ($10 delivered on Amazon). It is a fascinating historical account of the time of very low sunspots. It is a perfect example of “climate change” and where might be possibly heading. Of great interest is the chapter on the glaciers growing, destroying villages etc during those times. And of course the terrific toll of human suffering that occurs during a cold climate. And even more fascinating, the author, esteemed Brian Fagan, author of many archeological books, states in his forward he accepts the IPCC models w/o question. But I am not sure if he realizes that almost every page of The LIA and The Great Warming strongly call into questions AGW because every page proves the enormous natural variability our planet has always had. This is one science lesson that seems to have been skipped lately. This spotless count also includes the tiny tims, the sunspecks that there is much dispute over whether they should have been counted. Roberts laymens sunspot count looks at this. If we compared apples to apples we would be above 2008 already in spotless days. It’s interesting that 1953 and 1954 are among the top 20 spotless years, yet 1959 was the peak year of the 20th c for spots. Maybe we shouldn’t discount the possibility of another “sunspot tsunami”? Indeed, if the Alarmists were to admit the sun was a significant influence, then they could say that the reason global temperature indicators have not DOWN significantly during the solar minimum is because of the CO2 effect. Also note Hansen’s 3 year old prediction that we will have another global temp record by the end of next year. In January 09 he said that this could still happen with a 2010 el nino. Is ENSO weakening or strengthening? I would be interested if this topic could be addressed – guessing the big unknown is the delay in release of ocean heat – 2-4 years or 10-12 years? Norman –Well if CO2 were the ONLY effect on climate, then rising CO2 would cause a wamer surface. That is not hocus pocus. The AGW alarmism comes when climate models are set to predict that this bump in warming causes more water vapor to be pumped into the atmosphere from the oceans -reasonable AND that this water will stay as a vapor form causing additional surface warming to reach equilibrium of energy in from the sun vs the IR radiation out. –not reasonable assumption to make. IMO they don’t have any sound basis to assume that water stays as vapor and if it condenses/crystallizes into icy high clouds that will counteract the CO2 warming effect by increasing the albedo. Now add in the PDO oscillations, polar ice caps may increase from greater water falling on them, SO2 cooling (volcanoes, chinese and indian industry sources that do not scrub) and whether or not solar activity seeds clouds or not and a hosts of other factors that drive earths climate. The science is most definitely NOT settled. I live in northern Minnesota, and as totally anecdotal evidence, I believe the climate has already begun to shift into a colder state here. Perhaps I’m just “seeing things” as it were… because we had an unprecedented run of warmth from 1998-2006… but the weather has been as cold since early 2007 as it was warm during the 1998-2006 “warm episode”. It seems that the La Niña of 2007/08 did something to our climate here and sucked all the warmth out of it. All of the trends have completely reversed from where they were going. It is getting colder and drier and less humid. Minimum temperatures are cooling faster than maximum temperatures whereas before the opposite was occurring. 2008 was hte first year in our recorded history that no 90˚F+ day was recorded, and 2009 only saw one such day.. which has only happened a handful of times. We had both unusually late and early frosts in 2009 contributing to one of our shortest growing seasons ever, behind only a few cold summers in the 1910s and, more recently, 2004. In fact, our summers have been cooling at a rate of 0.64˚F/decade since 1970. 3 of the coldest summers on record have all occurred since 2004. In April 2008 we had a record 51 inches of snow.. more than any other calendar month ever recorded, let alone breaking the April record which led to delayed ice out dates on the region’s lakes. Winterkill was observed in many lakes in 2008/09 for the first time in at least 20 years (where the ice gets so thick that the water below gets de-oxygenated to a point that kills massive numbers of fish)… it’s not so much one big flashy record we’ve seen.. but a series of indicators that the climate has begun to get colder and has reset itself to a colder state not seen in quite some time. And this time we can’t blame Mt. Pinatubo either! As a first order approx. the layman’s count seems to be about 20% higher than the SIDC. Apples to apples then we might be at 306 already compared to 311 in 1913. Interesting. OT: The latest UAH anomaly for Nov. is out. It is .50. It appears the El Nino is having a strong impact as many have predicted. I have been remiss on this lately. What I intend to do is take the area measurement for 2007-2009 and compare them directly to SC cycle transitions 13/14 and 14/15. And just let the apples compete with the apples. My conversion of decimal years to months failed dismally. I’m rather indifferent to staring at sunspot numbers, in isolation. I’d suggest adding TSI data for context. Long range models show cold coming on with a vengeance. The 700 mb plot looks a lot like it did in October but with much colder temps. Heat leaves earth mainly by convection – hardly any leaves by radiation. clouds prevent convection – not necessarily vertical convection. An overcast night gives stable air layers, and convection is not occurring. A clear sky means convection is occurring. There is a lot of convectional loss unless its blocked by layering stable masses, since the earth is warmer near the surface. carrot eater: You can check the WFT (Wood for Trees) link at the bottom of the list of WUWT recommended “tools” sites above. TSI since 1979 is one of the indexes you can compare to temps and sunspots. addendum – when working with thermal imaging at night, especially with overcast nights, if you point at the ground you see nothing – no radiation, yet if you point at the sky, you see a glow of heat spectra.. I suggest those who have access to such equipment try this to see just how little radiation leaves the surface. November has been a big letdown for those expecting a ramp up of solar activity. The SIDC unsmoothed monthly average coming in again at 4.2. There is such a long way to go before even reaching 50SSN which is the max number I am banking on for SC24. The last time the SIDC monthly mean was over 5 is around Feb 2008, This month according to the Layman’s Count we arrive at 1.7. Many specks were counted by SIDC and NOAA during November which artificially raises the count based on past methods. The Layman’s Count for 2009 spotless days is at 297 with one month to go. If we used the Layman count to compare with on Paul’s chart it would be even more impressive, but we must keep in mind the yearly count is not really that significant. There is an atmospheric effect which has been called greenhouse effect, but it is not the same as for a glass greenhouse (which traps air & stops convective loss). CO2 does absorb and re-emit some portions of long wave IR and this does raise the ground temperature some. However this is a fairly small effect. Water vapor is a larger effect. Clouds are an even larger effect, with some difference in the absorption physics. Water droplets are approximately black bodies for long wave IR. Black body radiation has a term (T hot to the forth power -T cold to the forth power), with all temperatures in degrees above absolute zero. If there were no gases or water droplets, the ground would radiate to space, where space (T cold) is ~4 degrees K, so the second term is very small. However the absorbing gases (e.g., water vapor and CO2), and water droplets are much warmer than space, so the effective radiation from the ground is partially reduced by the second term. That is the so called greenhouse effect. However, since Earth is mostly covered in water, the water vapor and clouds totally dominate this effect. Locally, clouds are the biggest effect, and make a large difference in cooling from the ground. However, the fact of CO2’s portion of the effect on the average is the whole issue of the debate. It appears now that the water vapor and cloud levels self correct at least part of other greenhouse increases to make it of little average change. Somehow I don’t think Planet Earth is much concerned by what we lable as sunspots or spotless days. It will be the total change in delivered energy that effects the future climate. The radiant temperature of the sky (as seen from the ground) depends strongly on the dew point. A clear cloudless sky indicates a very low dew point (ie no clouds) and as a result a very cold sky. On a cloudy night the radiant temperature of the sky is much higher (less heat lost to the sky/space). Well, this handily explains the dew on my car, and sometimes ICE/frost on the car as well in the morning although the air temperature is above freezing and/or the dewpoint. I would recommend some field observations for you chaps over a night-time cycle with a couple thermometers in various locations then draw some conclusions. odd, Space Weather.com is reporting 252 spotless days, not 262. Wonder what the divergence is? Hi Nonoy, The International Sunspot Number from the SIDC takes a large number of observations from all over the world. They then have a procedure where they eliminate the outlier obs. I’ll bet spaceweather.com is just repeating the values from NOAA’s space weather prediction center. With all the tiny, short lived micro spots, and NOAA’s superior observational equipment, I wouldn’t be at all surprised that 10 days where NOAA found a spot got thrown out as outliers. The SIDC then multiplies by a calibration coefficient to attempt to make up for the improvements in technology. For instance, if you look at the formula, the lowest possible sunspot number (other than 0) is 11. Yet SIDC is often reporting 7, 8, 9 etc. I use the SIDC numbers because I figure the multiple obs from all over the world makes it rather robust. I’ll have to check out Geoff’s Layman’s Count though. In addition to the dearth of sunspots in the current cycle there has been a steady decrease in the intensity of the magnet fields that cause the spots. This has been going on since 1990. As the field intensity decreases so does the darkness of the spot. If the trend continues there will be no visible spots after about 2015. This is based on the work of Livingston and Penn at the NSO. Here is a link to the journal article…check out figure 3. So 1932, 1933, and 1934 are all in this club of top 20 spotless years, and yet 1934 was the ‘hottest’ year (at least in the USA). Hmmm. The oceans are a humongous heat sink, thus there is a lag as temperatures during the minimum are impacted by the release of the heat that the oceans had absorbed previously. At present the higher monthly UAH figures are being driven by an El Nino, i.e. the oceans dissipating previously captured heat. It must be snowing in hell. Climategate made it to the CBC tonight. 3rd story from the top. In my opinion, quite balanced. Even mentioned that Canada is one of the biggest skeptic countries. Last time I checked, the clouds go whither the winds blow them. And can appear from what seems to be nothing but clear sky . . . and appear and even snow quite heavily a couple of hours after a weather report of “fair and clear the next 3 days.” I have personally experience the last on more than a couple of occasions. I would suspect, being only a civil engineer, that the clouds are a result of other things happening, as opposed to them being the master of any weather events. And there were diurnal ranges much larger than todays. 68 degrees between daytime high and nightime low is a lot. Helped out in no small measure by single digit Relative Humidities. There is no simple magic formula or bullet. You also have to deal with the state of the oceans at the time. That being said, there is something to think about in long runs of spotless days resulting in the Weather morphing into the Wild Thing. That graphic says a lot. Don’t change anything, just keep up the good work. this is at once most fascinating, and received with great appreciation. I had wondered for some time what had happened to the usual sun blog here whilst recognizing the immense importance of the climategate fiasco. I often look at the inactivity of the sun with one eye on the interesting apocalyptic theories surrounding 2012. Somehow these sun data seem to be telling us we are converging on something massive about to happen. Whilst a lot of 2012 theories may be viewed by some as pseudo science let us bear in mind there are many historical precedents saying we are in for some turbulent times and the sun may be at the heart of this. I wonder, can you say if there is any mileage in the theory we are entering the galactic center so to speak? And will this have a bearing on the suns activity? If there is a stronger gravitational field as we enter the plane of the ecliptic I believe it is called, will this have an effect on the sun, on its magnetic fields? I take note of what Patrick Geryl says, can anyone comment on this? If the sun is inactive is it because its magnetic fields are so entrapped about themselves it us like a pressure vessel, and is simply containing energy in itself, until these magnetic stresses no longer hold and as Geryl says, then the whole sun will flare into extraordinary activity? Thus, can we expect a magnetic bow wave and solar mass ejection when these stresses no longer hold? And is this what the authorities are worried about as we approach 2012? I have a wide open mind on all this may I say. Googling around I found this old Physics World article that may give another look at solar activity in the past. One thing I’ve always wondered about is how are counts normalised so that comparing what we are able to observe with today’s instruments with centuries past with crude or no instruments are matched, even after accounting for the eliminate the outlier obs? It seems to me that past centuries could only observe the largest spots and so wouldn’t we have more spotless days if we use that as the standard? Also isn’t it time to work out a better metric that is perhaps more valuable rather than just raw counts, but perhaps %age of surface covered so small spots are not given the same weight as large ones? Yes – and it is well documented. See PowerPoint presentation here by Dr Svalgaard. That’s exactly what the Layman’s Count attempts to do. The answer to one of the first posts about clouds and temps is easy. It is called radiational cooling. We get it a lot here in Northern WI, and clear skies are an integral part of those -30ºF nights we get in January. Look at the clouds like your hat. Both keep heat from radiating away from the source. It is not surprising to see temps rise a little in the latest widget update. The El Nino has gained strength since October. There is some cold water showing up in Nino 1, so a guy can hope. Welcome back Dr. Svalgaard! I very much appreciate your contributions here. 3. A PDO/AMO index on the wane which might point to a trend of decreasing temperatures. 1. A short-term increase in temperature as the El Nino effects and slowly rising sunspots join forces. 2. A longer-term significant fall in temperature as the greater propensity for La Nina takes over due to the PDO/AMO state. 3. The magnitude of the decrease being dependent on the nature of the next two sunspot cycles and the contribution of heat release from oceanic stores. 4. If carbon dioxide contributes something, this may ameliorate any effects as it is still rising fairly strongly and will continue to do so up to 2020. Any thoughts from the sages as to what the most likely scenarios are based on those parameters and any thoughts on the probabilities assigned to them? Corbyn won’t reveal all his work as he maintains that it is commercially sensitive! I can understand therefore why he wouldn’t release too much “how to” stuff. The “trick” is, does he get it right most of the time? He had approached the Met Office & the government in the past, & like all potentially great scientific/engineering discoveries made in the UK, it was ignored, e.g Barnes Wallis’ swing wing concept. BW always claimed that he must have upset someone in the Air Ministry before or just at the start of WWII, as he was frequently blocked at every twist & turn ever since. I will be watching the Solar activity with a keen eye over the next few weeks. It will be interesting to see whether such a potential milestone event will be reported by the BBC straigh away, or more likely, waiting several weeks when a suitable moment appears in the news front, such as a natural disastar or regretfully a terrorist attrocity, where such a momentous point can be lost , as in “now would be a good time to bury bad news” sort of thing, as is there wont! May you “hide the decline!”. Don’t say that Dave, I moved to North Carolina from the People’s Republic of Taxachusetts. It looks like Maurice Strong, “Father of Global Warming” made the correct move when he took over the Bacca ranch in Colorado. It is sitting on some of the most fertile land in the USA, three major underground water sources and of course oil. If there is an Ice age, what will Strong’s ranch look like? Looks like Strong is very well placed if an Ice Age comes along. I have always wondered if he actually believes his own hype. If the elite really think we are headed for an ice age [Milankovitch cycle], it would explain the grab for power and control of the food supply, the attempt to kill the transportation industry as well as why Baxter sent out a bio-weapon instead of a flu vaccine material to medical distributors in 18 countries. Are the plans to drastically cut back the population and prevent them from easily moving to better territory? “Was the viral contamination intentional? To put it bluntly if penicillin can not be legally manufactured in the same facility as other medications due to cross contamination problems, then what the heck was a bio-weapon doing in a human medicine manufacturing facility??? That graphic to me is misleading, the curves start off at totally different heights, the 2008 curve should include the period when F10.7 was at 120, and we would get a totally different picture. 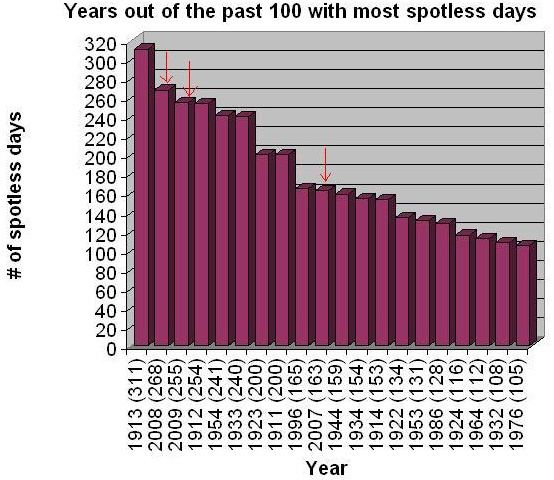 The Layman’s count will be the only relevant count if we wish to compare with sunspot data before 1910. According to spaceweather.com we are still in deep solar minimum. Bob k6tr at the SC24 discussion board disagrees with this and claims SM is over as we have passed its deepest point in Dec 2008. That may be so, but looking at solar wind and Planetary K-index, they are both extremely quiet for November. Flare activity is near non-existent. Whilst flux has increased slightly the monthly average has still not reached 75 to date. Looking at magnetograms for November we see many tiny SC 23 signatures and reversed 24 signatures, tiny yes, but the most noticeable features during blank days. The rare large SC 24 magnetic regions for Nov only produced faint paint-spatter-like pores. The monthly sunspot number has been below 5 for 20 consecutive months. It would be interesting to know which month is month of sunspot minimum (smoothed) and what is its value according to the Layman’s count as it would probably differ to International. We can still see that the sun is showing unusual behavior. Regardless of what the official sunspot minimum is, we are clearly not yet seeing signs of a strong ramp up and we are much closer to deep minimum conditions than a strong recovery. “…The liberal blogosphere thinks Obama is George Bush II. So much for HOPE and CHANGE. And you thought there was actually a difference between the Republicans and Democrats??? Check your history. The Federal Reserve Act of 1913 was sponsored by democrats. A Democrat, Clinton (and his buddies at Monsanto and Cargill) gave us the World Trade Organization. I am betting the Health Care Bill, if it passes will be the Federal Reserve Act for Insurance companies after they finish modifying it. In other words the Insurance companies will have complete control and be exempt from Congressional oversight just like the bankers control our money with no Congressional oversight. It took the bankers less than fifty years to achieve than, I wonder how long the Insurance Companies will take? If the elite want to slip a really pro-wealthy bill pass the US citizens they get the democrats to do it. Activists are so gullible they never bother to look behind the curtain and see where the money trail leads. Waxman, of Cap & Trade fame, has a Food bill that is another pro-wealthy bill the democrats are pushing. I live in NC and I compared 2009 to 2004 awhile back. In 2004 we hit 93F in April and by May we hit 98 twice. While in 2009 the maximum in May was only 89, June was 93, July 95 and August 96F. I have lived here since 1995 and spend most of my time outside building barns and putting up fences. Temperature between 95 and a 100 were typical for the summers here up until recently. I also noticed the “reported” temperatures for the “location” are always higher when reported on the next day this year. I might have missed the actual high temp but the low at dawn is at or close to the minimum and there is no way it is going to be HIGHER than the temperature I saw in the morning the day before yet it is anywhere from 1 to 4F higher but never lower. I am still amazed with the precision we detect sunspots today. We use satellite images which give us a resolution of the sun surface which was not available 50 years ago. To what of a resolution were scientists able to observe the sun surface 50 or 100 years ago? Does anyone try to observe the sun surface today himself/herself? Just consider using a pair of “household” bino’s (7×50 or 8×40) with dark foil (or aluminium foil) and look into the sun? Besides the cloud problem on rainy days, your eyes are going to hurt! I would argue that there were tiny “missed” sunspots in earlier times (before the satellite age) and if you would apply those rules into our time – then we would have even more days without sunspots! The Maunder minimum could easily been repeated today (Cycle 23-24)! The galactic CENTER? The distance of the Sun to the center of the Galaxy is 28,000 light-years. The Earth is always in the plane of the ecliptic… by definition! We are at about the right time for a de Vries minimum in solar activity. The cycle is someplace between 180 and 220 years long and its been about that since the Dalton minimum. Three things jump out at me. First was that the record high temperatures of the 1930s came just after a three year span, and we so far are in a three year span of low sunspots. Second was that between 1911 and 1934 (23 years) there were 10 years of low sun spots and from this point on we temperatures have steadly climbed. Apparantly helps if you start from a nice low point. Third contributing to the warming would be only one set of low sunspots with of two consecitive years, the rest happen at the 10 to 11 year cycles. I know perfectly well where to get TSI data. I’m making a suggestion on how to improve articles like this about solar activity: instead of just giving sunspot counts in isolation, the TSI data would provide good context. Does anyone try to observe the sun surface today himself/herself? Just consider using a pair of “household” bino’s (7×50 or 8×40) with dark foil (or aluminium foil) and look into the sun? Besides the cloud problem on rainy days, your eyes are going to hurt! I hate to sound like some health and safety pedant but yes it’ll hurt and you’ll probably blind yourself too!! Buy a solar scope or use decent purpose made solar filters on a standard one. Even a tiny pin prick in a homemade lash up will do considerable permanent damage. If you can’t afford that, project onto card in the time honoured fashion instead. Albuquerque growing season correlation to Ap Index shows a lag of 5 years. This winter or the next should be interesting. Here are some things we should keep in mind in with Mr. Stanko’s to-the-point article; I’m sure readers will add others. 1. Some have referenced that the data collection methods for sunspot detection have improved. Being careful to remember it as a conservative assumption, a more accurate count now would mean that earlier (pre 1850 so Dalton and Maunder would be included) might be undercounted. And don’t forget we only look at half of the sun anyway but because of sunspot duration, the western limb data probably reflects up to at least 1/3 of the opposite side. 2. The graphic compilation http://www.leif.org/research/TSI-SORCE-2008-now.png provides an up-close look a the cycle 23-24 transition. While TSI and F10.7 appear to show the beginnings of an uptick in Cyc24, the MF component and the recent presence of Cyc23 sunspots belie this assumptiom. 3. “Averaged over the globe, sunlight falling on Earth in January [at perihelion] is about 7% more intense than it is in July [at aphelion],” says Roy Spencer of the Global Hydrology and Climate Center in Huntsville, AL. 4. It would be dubious to make predictions based on the latitudes of the sunspots during the current cycle 23-24 transition. 5. I’ve seen numerous comments about the El Nino. As I understand it, this pattern is most conducive to transferring heat out of the oceans and delivering it to the atmosphere. For this to occur during a minimum, where with the onset of cyc24, global ground temps are still running near recorded highs, my actually hasten a prolonged drop in temps. 6. I agree there is some correlation between long solar cycles and temperture (longer cycles and lower temps) and if you consider the ocean as a large thermal capacitor you would it expect to discharge at a higher rate when the input signal (simplified-radiant heat from solar forcing). In that context an El Nino would make sense. All, this is one of most congenial sites I’ve seen during this climategate debate, and it is appreciated. However, I’m impatient to get past the politics and fraud alerts and to see the science get on the right track. Leif, have Livingston and Penn collected readings for the spots numbered during the month of November for their Umbral data plot? Are the readings falling in line with the prediction? When I say galactic center I mean the void that overlooks the center, not the literal center. Our position overlooking this center. I believe we are in the process of passing through this less populated part of the galaxy now where it overlooks the central black hole so to speak. This point should be clear. The information on Patrick Geryls website sums up the point I am making, also the work of Paul la Violette. Also, i am asking if there is something in the theory that the suns magnetic fields become so wound up over time eventually it responds by a huge release of energy and if this process is what we are observing in the presently, quiescent sun. And if this energy is being held until some stress release mechanism causes an expansion of the magnetic field and possible solar mass ejection. I have no views on this at all, but these are theories that are bandied about, does anyone give any scientific credence to them? Umm Det, I once used a 10 x 50 pair covered with aluminum foil and just two pin holes pricked into it. Apparently my corneas turned into a puff of smoke almost instantly… or so they say because I didn’t see it happen. Can you make a movie? Can anyone tell me how the solar winds reported on Space weather.com can be 241.4km/sec? I was under the impression that the minimum solar wind needed to be 250km/sec for the solar wind to escape the suns gravity. Well, somewhere after Plato – all the people who followed his mistake of the mind-body dichotomy have gained the upper hand in the power struggle. Especially bad marks to those who believe a shallow polemic named Karl Marx. Ayn Rand describes their agenda in “The New Left – The Anti-Industrial Revolution” (newer edition called Return of the Primitive” as that is what they want to push humans back to). OTOH, Aristotle got the right answer, and the CRU schemers are an example of avoiding reality of his maxim “A is A”. I could qualify to work at CRU? Oh, fiddle – the usual email quoting marks (chevrons) doesn’t work on this blog software – an example of how easy it is to goof up. So “Where did humanity get it wrong? Was it in Montreal, or in Kyoto? Perhaps the moderator could kindly put the quoted above into my first post and delete the correction posts? Thankyou. As I recall, there was a lot of cold weather after 1954 and into the 70s! Gail: You are absolutely right there is not a dime’s worth of difference between Democrats and Republicans. The financial elite control both. As one senator (forget which one, but he was a Democrat) recently claimed: “The bankers own the place [Congress].” The financial elite also own and control the media so all we hear is what those elites want us to hear. It is just that people like David the Engineer do not seem to understand what is going on. The financial elite are extraordinarily good at making the rest of us fight over much ado about nothing. Divide and conquer. Very Machiavellian. And the health care bill will be a fiasco for everyone but the insurance companies and big pharma. Without a real choice between government insurance and private insurance, the private insurance monopolies will just tighten their grip on the rest of us. True insurance choice would be like getting to choose between public education and private education. Yes, it will be interesting to see what occurs in the near future. If there were only two factors in play, GHG and sunspots, and no noise in the observations or system to worry about, then we would have a filled table of contrasts and be able to say what cause what. Unfortunately the situation is not all that simple. 2. The graphic compilation http://www.leif.org/research/TSI-SORCE-2008-now.png provides an up-close look a the cycle 23-24 transition. While TSI and F10.7 appear to show the beginnings of an uptick in Cyc24, the MF component and the recent presence of Cyc23 sunspots belie this assumption. Yes the average field was 1969 G and intensity 0.831, right where they should be. My plot at http://www.leif.org/research/Livingston%20and%20Penn.png is always up-to-date as Bill Livingston sends all his data to me as soon as he has them. Readers haven’t read much from Dr. Leif Svalgaard recently because the posts have been dominated by Climategate and Dr. Svalgaard doesn’t have much to say about that…telling. From what I’ve gotten from Dr Svalgaard, he is an AGW proponent — but he doesn’t know how strong the supposed AGW effect is. Dr. Svalgaard has repeatedly and forcefully stated that sunspots or the lack thereof has little or nothing to do with climate variations. Also, Dr. Svalgaard tends to support conventional scientific thinking, the status quo — and regrettably, say what you want — the majority of scientists have remained quiet during Climategate because it throws an unfavorable light on the state of science in general in many disciplines because these kind of activities highlighted in Climategate have pereated more than just climate science. So, I’d be suprised if Dr. Svalgaard offers an opus on Climategate (but I’d be very interested in what he has to say, if he chose to). More likely, he’ll keep his head down and concentrate on what he does best (and does exceptionally well), measure the Sun’s output. Thanks for the explanation on MF. I have an EE and nuclear physics background and semiconductors are keeping me very busy. So climate science is a hobby for me. You indicated the minimum was in Dec 08. It seems many people see the minimum as a point in time rather than a threshold. For those of us who follow this science more as consumers rather than contributors, where can we find, or can you provide a list of “things to look for” to improve the general understanding of the events we see? Most of us with science backgrounds (applied or not) are accustomed to drawing our own conclusions based on data, and we try to do that based on what little we know. Therefore, it takes discipline to restrain judgement when we don’t have sufficient information when we think we might…. For the majority for whom climate/solar science is a hobby or even a passing interest, what guideance or direction do you suggest for those just getting started? And considering the tone of your posting, you won’t hear from me again. I would hope one man’s opinion wouldn’t keep you from speaking out. That certainly hasn’t been your pattern. In a complimentary way, folks that are forceful in various professions, are known as “bull dogs” (again, this is generally a compliment to the tenacity of the individual). I’m sorry if my “tone” was offensive. What “tone” was that? But I’m more concerned about facts and evidence. If I’m inaccurate in my statements or characterizations, I want that pointed out. Many readers, here, have great respect for your opinions and expertise in tracking and measuring the Sun’s output, and I agree with that assessment, if not all the corollary conclusions you so forcefully express. Please don’t punish readers of Watts Up With That? because I or others may disagree with your corollary conclusions. Jonesll: Dream on. It’s those dreams of fortune that perpetuate the reality. Please, Leif, just ignore people like that. It is good having your input on sun matters, and all reasonable readers of this blog know how to classify such opinionated pieces as the one above. CO2 does not make clouds. Clouds are water vapor. Clouds provide cooling during the day by reflecting sunlight away from earth. They retain heat (which is different from warming) at night by inhibiting the radiation of heat to space. Humid air is less effective at cooling the ground via wicking/evaporation/transpiration than dry air is, as well, however precipitation from clouds helps amplify this cooling effect. So clouds can perform both warming and cooling depending on day or night, rainfall and wind speed, as well as, apparently what altitude the clouds are at, with high clouds more effective at reflecting insolation back to space, while low clouds tend to warm the troposphere and stratosphere more while radiating to space. Note that I did not mention CO2 once here. The assumption that CO2 causes warming is based on some laboratory experiments on CO2 in a chamber, at high concentrations. I have not heard of a study that tests trace levels of CO2 in a low pressure environment akin to the high altitude that CO2 is supposed to be reflecting heat back from. If anyone knows of one please cite it. Leif’s work is an open book, he hides nothing. He has his opinions, and we all have ours. As a source of Solar knowledge, he’s been an encyclopedia to us, including references. He also happens to be one of the few to be left standing as regards SC24 predictions. And the only one I know of that communicates directly. Actually James, he didn’t, I did, but not against people who merely disagree with him. I think there is a vast distinction between reasonable and respectful intellectual discussion and debate, and some of the rude calling out on the carpet type attitudes we’ve seen from some people toward Dr. Svalgaard. I disagree with him on some things, but he knows a lot more about his discipline than I could hope to know, and look forward to learning more from him in the future, and hope he participates more here. The alarmists claim that skeptics websites are full of rude and offensive snarky comments as an excuse to refuse to participate here, despite the clear evidence of worse behavior at RC and CP that anybody who has spent a few minutes browsing those sites can see with their own eyes. Steve McIntyre is pretty strict about posting on CA and despite him strictly policing comments there, the Team continues to insist its offensive there. Their opinion doesn’t matter to me so much as ensuring the public is able to tell the difference with their own eyes. Just as we are winning the public battle in Climategate by sticking to message that data and methods should be open and transparent, and that peer review needs vast improvements, which any reasonable person cannot help but endorse as common sense and reasonable, it is important that we also win the PR battle on who has the more civil websites. Part of this is showing respect for science professionals who do post on skeptic blogs like WUWT and CA, even if we disagree with their positions. The only people we should be see rudeness from here are AGW cultists. Everyone else knows how to be better than that. Do you have a citation for that? I have seen Dr. Svalgaard call baseless nonsense exactly that and I have seen him object to abusive ad homs and other such prattle. I rather doubt he called for someone to be banned merely because they made some otherwise reasonable statement he didn’t agree with. Your innuendo about his motives through out your post are quite repugnant, regardless of the patronising pat on the back you give him at the end. What a joy to see that Leif is back amongst us! I regard him as one of, if not the, most valuable major contributor to WUWT. Do you know the works of Dr. Stephen E. Schwartz? Leif Svalgaard (11:12:30) : I think you are trying to say that any set of values of B below your chosen equilibrium will mean runaway down and any set of values above will mean a runaway up, so should B fall to and stay for a thousand years the range 4.0-5.5 nT, the Earth would freeze up. I think that invalidates your model. I am a little reluctant to include too many terms in a simple model like this, since too many terms and parameters can fit anything. Thus I would like to ask you whether you think the heat balance of Schwartz is scientifically sound, or whether it should be modified. Is this the simplest possible heat balance for our planet that also makes sense scientifically? If this is the case, perhaps it contains so much information that it actually can be a useful approximation? What do people think might be the effect of the following on warming or cooling of planet Earth? Is it an ideal time to test the cosmic ray theory on cloud formation? I know about CERN’s CLOUD experiment but seems to me this might be the real deal but I admit I have no clue that’s why I ask. Jimbo (13:46:14) : Question: What do people think might be the effect of the following on warming or cooling of planet Earth? Is it an ideal time to test the cosmic ray theory on cloud formation? HELIOSPHERE TO SHRINK EVEN FURTHER, RISE IN COSMIC RAYS? “Since early today, the solar wind has virtually vanished, reaching exceptionally low speeds (now at 250 km/s), low densities (< 0.1 electron/cm3) and low plasma temperatures (< 10⁴ K), based on ACE and SOHO/MTOF data." Bryan Madeley (13:00:29) : What a joy to see that Leif is back amongst us! I assume that there is a standard correction to be applied (what index doesn’t have one) that would make the Solar Wind speed > 250km/s, but the PRESTO alert makes it clear: The solar wind did shut down today to minimum speed. There is a minimum due to the laws of physics that Leif explained, it has a floor due to expanding plasma. Perhaps we get a real measurement to verify the physics, eh? Wow, after looking at these graphs and correlating all my Raw data which I have now disposed of, it has become clear to me the the rapid decline in the sunspots is MAN MADE. Yes, the debate is over, we are to blame and unless we take drastic action right now the polar bears will die and life as we know it will end. I suggest, no demand, that we create a new world government charged with reversing the damage we have caused to the sun. They should have unrestricted authority over all nations and governments but not be seen as dictators. I am going to hold a summit called Solarhagen where the world leaders will agree to sign to all my binding terms. Let’s make Solarhagen Hopenhagen, vote now! Brian B (12:25:07) : to James F. Evans (09:47:59) : Your innuendo about his (Dr. Svalgaard) motives throughout your post are quite repugnant, regardless of the patronising pat on the back you give him at the end. Leif: Could you weigh in on the Solar Wind reaching minimum today? Gail: You are absolutely right there is not a dime’s worth of difference between Democrats and Republicans. The financial elite control both. Any of you folks _ever_ considered running for office? Ever heard of Sarah Palin – or are familiar with her story? Let’s look at Bolshevism – founded by Vladimir Lenin and who considered themselves as the vanguard of the revolutionary working class (of Russia). Sound just a little bit similar? God-dang-it…..just when we think we got him back…and you have to write those barbs, James. Leif…please weigh in. Your opinion is needed here….and greatly respected. Ignore the emotional chaff here. You know…It’s science that counts. And you are damn good at the science. Even though you and I don’t seem to get along on this blog, I HIGHLY respect you and your life’s work. Your opinion is most needed…especially in uncertain science times like this. The ONLY one on the site with that trait! It must be your medium for viewing Jim. I have a Mac. And most people can discern my italic quotes from the rest. Stop making an issue of it….as I have explained in the past….I am following the rules. It would say that it takes a long time to cool off a few billion tons of sea water… This isn’t like a light bulb. Sun damps, cold now. It’s more like a wood stove. No new wood in at midnight, still heats the house all night, only cooling the next day. But with decades instead of days. “…….Perhaps we get a real measurement to verify the physics, eh? It is a wander of nature that whenever we may think we know its limits, it pulls out a surprise. I hope good old doc Svalgaard is keeping an eye on this unruly bunch. His comments and guidance are great inspiration. Fact that I often go down slippery slope of quasi science, rather than well trodden path, is the excitement of stepping into unknown. So Dr. S we need you here. I think it is the slow moving oceans’ currents that do the long term job. While I will not put words in Dr. Svalgaard’s mouth, I was clearly under the impression that he has stated that sunspots do not cause warming in the past. I can definitely agree with that. Sunspots are generally an activity indicator, and are therefore not causal. Sounds like sound reasoning to me if I have read it correctly. By all means Dr. Svalgaard, please stay here! I have been frequently guilty of skipping post just to read yours when pressed for time. Regardless of the counting bias of current tech vs historical counts, what I find really telling is that we are in the front end of the cycle and the current cycle is already way up in the list of cycles with spotless days. Consider that all the other cycles are complete cycles and this is just a partial one. That would be like having 60 home runs by the mid-session All Star break in baseball and showing up on the list of all time hitters. We live in interesting times. Just as I find time to read all the way through, and find to my delight that Leif is back, he goes again! May I add to the caucus of appreciation and requests to stay with it and ignore the poor tone of some commentators. As Leif always points out – the correlation between low solar or interplanetary field and cooler temperatures on Earth is not as good as some would have it. Not enough to convince him, anyway – and we should bear that in mind. Others have pointed to the heat storage of the oceans. I think there has to be a prolonged low in the field – a shift in the jetstream (which does correlate well), and then timelagged forces that deplete heat stores – it then takes time to recover. The Earth’s system is still in recovery from the Little Ice Age, and as the cycles turn, we may be about to return to a one. I don’t think there is any prospect of a big ice age, as these are controlled more by orbital changes which are slow and not predicted to take effect for another few thousand years. If we are at the peak of the modern maximum, then the next peak in a thousand years time could be higher than now – long interglacials (20,000 years) are about 2 C warmer than short ones (10,000 years) and most climate science thinks we are half way through a long one. The duration of this near absense of solar wind is important to observe & measure. Should it continue for an extended period of time, it will also be important to observe & measure phenomenon within and including the Earth's magnetosphere for signs of corollary changes. Apparently, aurora activity is also at a minimum. What else may be effected? Will the height of the ionosphere be effected? Notice both show regional temperature drop well before onset of the Maunder minimum and rise well before the Mm ended. Since I do not have convincing hypothesis it is not surprising that Dr. S. would reject it. After comments by Dr.S. I abandon an initial attempt, did lot more research and now I am having another go. By popular demand, I’ll try again, but with fair warning to Mr. Evans and his ilk. The solar wind speed cannot fall below 250 km/sec [subject to the normal random fluctuations of some tens of km], because that is the escape velocity at the altitude from where we get the solar wind [this altitude may vary a bit too]. The density of the solar wind depends on how many protons are escaping which in turn depends on the density and temperature of the corona [which in turn depends on solar activity (which in turn depends on …, etc)]. But even if the temperature varies there will always be a ‘tail’ of protons with higher speed that the average, and it is from this tail that the solar wind is formed. But because the tail is ‘thin’ there are fewer and fewer protons with speeds high enough for escape for a lower temperature corona. So, some will always escape, but very few if the temperature is low. Thus the density of the solar wind can fall to very low values [100-1000 times lower than normal] for the slow wind. The magnetic field, on the other hand, is always dragged out no matter how thin the solar wind plasma is [within reason], so the magnetic field will not be significantly lower [there will still be compression and rarefaction regions due to solar wind with different speed being emitted in the same direction (because the Sun is rotating), but on average over a solar rotation the solar wind will be rather constant [currently about 4 nT]. Many CMEs will add further magnetic flux, so at solar maximum the HMF will about double. 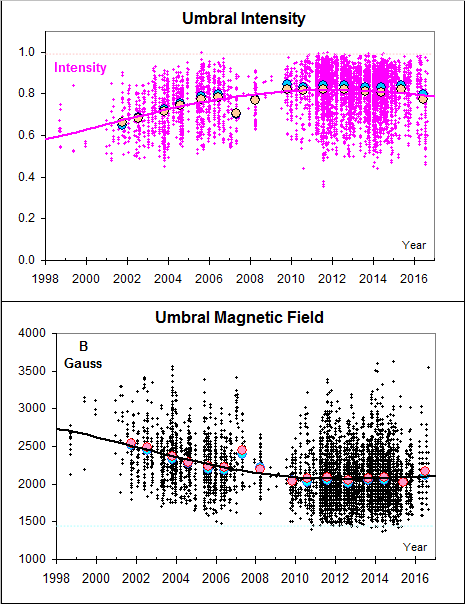 Cosmic rays are not modulated by the solar wind speed or the density, but by tangled magnetic fields, and since the magnetic field does not go to very low values, I would not expect any change in the GCR modulation. It takes 6-18 months [feel free to quibble] for the solar wind to fill up the heliosphere, so the GCRs will begin their decline about a year after solar ‘minimum’, so about now. The exact delay will depend on how much the new activity has added to the HMF, which may not be much, so a further delay is possible. We need some good-sized coronal holes at medium latitudes to produce significant modulation. All of this will, naturally, have little or nothing to do with any cooling/warming we observe at present or in the near future. Interesting about magnetic field, B is related to the individual protons, regardless of their number ? Presumably front end of the E’s magnetosphere would react if the ‘magnetic pressure’ drops due to the current low count? Since Helium is more massive than Hydrogen [alpha particles vs. protons] we would expect the ratio between alpha particles and protons to decline as the solar wind speed declines, because it is harder to expel a heavy alpha than a light proton. And sure enough that ratio does decline, to the point where it reaches zero [or rather: there are too few alphas to be able to measure them] when the speed declines to ~250 km/sec. B is related to the individual protons, regardless of their number ? No, B is dragged out by being frozen to the plasma. As long as there are enough protons to carry the current involved in freezing in of the plasma, B will be dragged out. No, the shape of the magnetosphere is largely determined by the density and the speed and not the magnetic field. The effect of erosion by a southward B is minor compared to that. During the famous ‘solar wind disappearance’ on 11 May 1999, the magnetosphere swelled to be six times larger than normal, even though B was close to the average long-term average. Thank you, Leif. Happy holidays! Buy long underwear before the Progressives tax ’em. Jim: Since you are throwing out anecdotes, maybe you have heard that the Walton family has more wealth than the 100 million poorest Americans? A giant arrow appeared on the Sun. The Tips article vanished. I suppose its removal was announced in the Tips article.